Indianapolis (the capital and largest city of Indiana, seat of justice of Marion co., situated near the centre of the state, on the W. fork of White river, 100 m. N. W. of Cincinnati and 165 m. S. S. E. of Chicago, in lat. 39° 47' N., Ion. 86° 6' W.; pop. in 1840, 2,692; in 1850, 8,091; in 1860, 18,611; in 1870, 48,244, of whom 10,657 were foreigners (5,286 Germans and 3,321 Irish) and 2,931 colored. The number of families was 9,200; of dwellings, 7,820. The population in 1874 was estimated by local authorities at 80,000. The city is built in the midst of a fertile plain, chiefly on the E. bank of the stream. The surrounding country abounds in black walnut, and in the vicinity is an extensive coal field. The streets are 90 ft. wide, except Washington street, which has a width of 120 ft., and cross each other at right angles; but there are four long avenues radiating from a central square and traversing the city diagonally. There are 200 m. of improved streets, most of them being gravelled, but many paved with stone or wood, and all lighted with gas. A system of sewerage is in progress. The river is crossed by nine bridges (three for railroad purposes), of which all except the old " national road " bridge are of iron. Two others are to be constructed. Street cars accommodate local travel. There are seven parks, viz. : the Circle, in the centre, containing 4 acres and ornamented with shade trees; the state house park, 10 acres; military park, 18 acres; university park, 4 acres; the trotting or southern park, with a course of one mile, 86 acres; a park in the N. portion of the city, embracing 100 acres; and the state fair grounds, with exposition building, containing 40 acres. Greenbaum cemetery is within the city limits, and is coeval with the city itself; 2 m. N. of the city is Crown Hill, which is handsomely laid out and tastefully adorned; and the Catholic cemetery is just S. of the city limits. 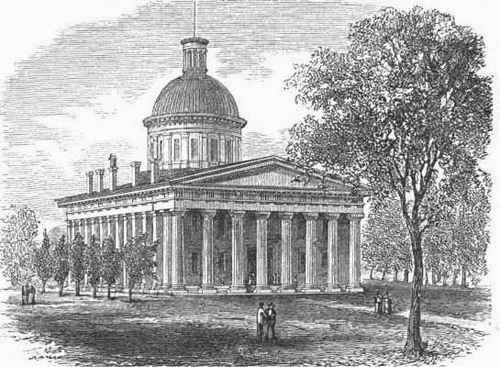 The state house, in the Doric style, erected in 1835, is 180 ft. long by 80 ft. wide, with a colonnade and dome. The state institute for the blind was erected in 1847 at a cost of $300,000; the grounds contain eight acres. The main building has a front of 150 ft. and is five stories high, consisting of a centre and two wings, each surmounted by a Corinthian cupola, the centre also having an Ionic portico. The state lunatic asylum, 1 1/2m W. of the city limits, was erected in 1848, and has since been twice enlarged, at an aggregate cost of $350,000. The principal building has accommodations for 525 patients; the grounds embrace 160 acres, a portion of which is handsomely laid out and adorned. The state institute for the deaf and dumb, just E. of the city limits, was also erected in 1848, and cost $220,000. The grounds comprise 105 acres, and immediately around the buildings are handsomely laid out, and adorned with trees and shrubbery. The United States arsenal, 1 m. E. of the city, is a handsome building, and is surrounded by grounds containing 75 acres. The union passenger depot, at which all the railroads converge, is 420 ft. long, and is one of the most spacious and convenient structures of the kind in the country. Other prominent public buildings are the post office, governor's residence (occupied by public offices), court house, county jail, city hall, city prison, academy of music, odd fellows' hall, masonic hall, and several of the churches. A new court house, costing about $800,000, is nearly completed, and the erection of a new state house, to cost about $4,000,000, has been authorized by the legislature. The city has railroad connection with all parts of the state and with the principal cities of the west. The lines centring here are 10 in number, viz. : the Cincinnati, Hamilton, and Indianapolis; Cleveland, Columbus, Cincinnati, and Indianapolis; Indianapolis, Bloom-ington, and Western; Indianapolis, Cincinnati, and Lafayette; Indianapolis, Peru, and Chicago; Indianapolis and St. Louis; Indianapolis and Vincennes; Pittsburgh, Cincinnati, and St. Louis; St. Louis, Vandalia, Terre Haute, and Indianapolis; and Jeffersonville, Madison, and Indianapolis. The Indiana and Illinois Central railroad is rapidly approaching completion, and a belt line, encircling the city and connecting all the other lines, is in progress. The number of passenger trains daily leaving and arriving is 78. The number of freight cars forwarded in 1873 was 296,314; received, 286,820. The first impulse to the growth of Indianapolis was the completion of the Madison railroad in 1847. The civil war concentrated a vast temporary business here, the effects of which were largely permanent. Iron founderies & machine shops. Oils, linseed, lard, and lubricating. The number of hogs slaughtered was 555,766. The value of manufactures in 1872 was $19,-671,832. There are six national banks, with an aggregate capital of $3,000,000; two state banks, with $800,000 capital; two savings banks, and three insurance companies. - The city is divided into 13 wards, and is governed by a mayor and a council of 26 members. There is a well organized fire department and an efficient police force, and the city is well supplied with water. The taxable value of property in 1860 was $10,000,000; in 1865, $20,144,447; in 1870, $27,000,000; in 1871, $27,999,170; in 1872, $34,760,871; in 1873, $65,000,000, the large increase being partly due to a change in the system of valuation. The city debt is about $1,000,000, and the rate of taxation $1 10 on $100. The principal charitable institutions are an asylum for white orphans, supported partly by a city appropriation, and partly by donations; an asylum for colored orphans and a "home for friendless women," supported in the same way; a German orphan asylum, with capacity for 300 inmates; a Catholic female reformatory and asylum, a Catholic infirmary for gratuitous relief of the suffering poor, two societies for the general care of the poor, a large, well conducted city hospital,.and a pest house. The reformatory for women and girls and prison for female offenders occupies a commodious structure just E. of the city. The Northwestern Christian university, chartered in 1850, occupies a handsome Gothic building in the N. E. portion of the city; it admits both sexes, and in 1872-3 had 13 professors (3 in the law school), 265 students (law department, 10; business department, 50), and a library of 5,000 volumes. The medical department of Indiana university (with which is connected a free dispensary), situated here, was organized in 1869, and in 1872-3 had 12 professors and 101 students. The city possesses an excellent and well organized system of public schools, embracing the various grades from primary to high school, and including a training or normal school. There are 20 school buildings, of which 10 will accommodate 750 pupils each. The high school will accommodate 550. The value of school property in 1864 was $88,500; number of children of school age, 6,863, of whom 1,050 attended public schools. In 1874 the value of school property was $691,256; children of school age, 19,125, of whom 9,868 attended the public schools. There are also a Catholic theological seminary, a Catholic boys' school, and a female seminary conducted by the "Sisters of Providence," recently opened and occupying a splendid building. The state library contains 15,000 volumes. A free city library was opened in April, 1873, in the high school building; it now contains over 14,500 volumes, and a separate building is to be erected for its accommodation. There are 6 daily (1 German) and 13 weekly (5 German) newspapers, and 13 monthly periodicals, one of which, the "National Crop Reporter," has recently been removed from Jacksonville, 111. The churches, 64 in number, are as follows:. • 8 Baptist, 5 Christian, 2 Congregational, 5 Episcopal, 1 Friends', 16 Methodist, 10 Presbyterian, 4 Roman Catholic, 1 Swedenborgian, 2 Unitarian, 2 Universalist, and the rest miscellaneous, some of which have no church edifice. - Indianapolis was first settled by John Pogue in March, 1819, and in about a year from that time it numbered 15 families. It was chosen as the seat of the state government in January, 1821 (though the capital was not actually removed from Corydon till 1825), and at the same time the legislature gave it its present name and appointed commissioners to lay it off as a town. It was incorporated in 1836, and received a city charter in 1847.